Epigraphy is the study of inscriptions or epigraphs that have been engraved into durable materials, such as stone, or cast in metal. A branch of archaeology, the science of epigraphy attempts to classify these writings as to cultural context and date, explaining them and assessing what conclusions can be deduced from them. Without such objective data, many objects and their inscriptions can be misinterpreted. Much of our understanding of some of the oldest (and long dead) civilizations of the world come from studying of the written records they have left. The work of epigraphers to ensure that the materials are authentic, to date them accurately, and to provide historical context for their content is thus a valuable contribution to the advancement of our knowledge about these people who inhabited this earth in ages past. Understanding their lives helps us to come together as one human family. The word epigraphy comes from the Greek language|Greek epigraphē, which translates as "To write on." The word came into the English language as epigraph, which was used to define any inscription on a structure, or a commonly used motto or saying. When the discipline of studying such inscriptions was established, individual scholars were referred to as epigraphers or epigraphists, and the discipline itself was titled epigraphy. The first to practice epigraphy were the ancient Greek scholars Thucydides and Polybius, who took an interest in ancient Egyptian and other inscriptions from older civilizations. Later, European scholars during the Rennisance took an interest in Latin and Greek inscriptions, and started to develop methodologies towards studying epigraphs. Toward the sixteenth century, standards had been developed, and larger, more organized epigraphy projects became established. One program that grew out of this tradition is the Corpus Inscriptionum Latinarum. Begun by Mommsen and other scholars, it has been published in Berlin since 1863, though with wartime interruptions. It is the largest and most extensive collection of Latin inscriptions. New fascicles are still produced as the recovery of inscriptions continues. During the late eighteenth and early nineteenth centuries, when the roots of archaeology were being established, it became apparent that epigraphy was to play a large role in understanding ancient cultures. The most famous example is perhaps the Rosetta Stone, which allowed Egyptian hieroglyphs to finally be deciphered, and thus allowed Egyptologists to learn more about Ancient Egypt than they ever had been able to. Epigraphy is a primary tool of archaeology when dealing with literate cultures. The U.S. Library of Congress classifies epigraphy as one of the "Auxiliary Sciences of History". Epigraphy also helps identify a forgery: epigraphic evidence formed part of the discussion concerning the James Ossuary. The character of the writing, or the subject of epigraphy, is a matter quite separate from the nature of the text, which is studied in itself. Texts inscribed in stone are usually for public view (or for the view of a god, as in the Persian Behistun inscription), and so they are essentially different from the written texts of each culture. Not all inscribed texts are public, however: in Mycenean culture the deciphered texts of "Linear B" were revealed to be largely used for economic and administrative record keeping. Informal inscribed texts are "graffiti" in its original sense. It should be noted that the study of ancient handwriting, usually in ink, is a separate field, called Paleography. Epigraphy focuses on study of the character and style of the writing, and the nature of the material in which it is inscribed, rather than the content of the text. Without such information, the context of the writings is unclear and unauthenticated. Epigraphy, therefore, attests to the validity of such writings, placing them within the timeframe and context of human history so that their content can be understood and its significance recognized. A sample of the most notable inscriptions that have been discovered and studied by epigraphers and others, providing deep and otherwise unattainable insights into these long-gone cultures, follows. The Rosetta Stone is an ancient stele inscribed with the same passage of writing in two Egyptian language scripts and in classical Greek. It was created in 196 B.C.E., discovered by the French in 1799, and translated in 1822 by the Frenchman Jean-François Champollion. 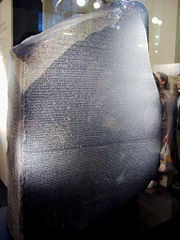 The Rosetta Stone was inscribed with three scripts so that it could be read not only by the local populace, but also by visiting priests and government officials. The first script was Egyptian hieroglyphs, the script used for religious documents and other important communications. The second was Demotic Egyptian, which was the common script of Egypt. The third was Greek, which was the language of the court. Comparative translation of the stone assisted in understanding many previously undecipherable examples of Egyptian hieroglyphic writing, changing the course of Egyptology. 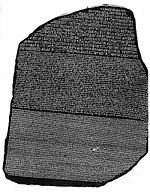 The phrase "Rosetta Stone" is often used to indicate something that is a key to deciphering hidden meaning, as this stone was the key to finally unlocking the mysteries of the great civilization of ancient Egypt. The Behistun Inscription (also Bisitun or Bisutun, بیستون in modern Persian; in Old Persian is Bagastana the meaning is "the god's place or land") is to cuneiform what the Rosetta Stone is to Egyptian hieroglyphs: the document most crucial in the decipherment of a previously lost script. It is located in the Kermanshah Province of Iran, and contains three versions of the same text, written in three different cuneiform script languages: Old Persian, Elamite, and Babylonian. Successive work by Georg Friedrich Grotefend, Henry Rawlinson, and others resulted in translation of the text by the mid-nineteenth century. This enabled many other cuneiform texts, preserved but undeciphered for centuries, to be translated revealing much about the most ancient civilizations of human history. This is a significant step in the advancement of human knowledge and the understanding of ourselves and our past, and serves as an essential foundation for a better future. The Decree of Themistocles is an ancient Greek inscription discussing Greek strategy in the Greco-Persian Wars, purported to have been issued by the Athenian assembly under the guidance of Themistocles. Since the publication of its contents in 1960, the authenticity of the decree has been the subject of much academic debate. The decree directly contradicts Herodotus's account of the evacuation of Attica in 480 B.C.E., in which it is stated that the evacuation was an emergency measure taken only after the Peloponnesian army failed to advance into Boeotia to fight the Persians. If the decree is authentic, the abandonment of Attica was part of a considered strategy aiming to draw the Persians into naval combat at Artemisium or Salamis. The Dipylon inscription is a short text written on an ancient Greek pottery vessel dated to 740 B.C.E. It is famous for being the oldest (or one of the oldest) known samples of the use of the Greek alphabet. The text is scratched on a wine jug (oenochoe) that was found in 1871 and is named after the location where it was found, the ancient Dipylon Cemetery, near the Dipylon Gate on the area of Kerameikos in Athens. The text is written in an archaic form of the Greek alphabet, with some letter shapes still resembling those of the original Phoenician alphabet. It is written from right to left, with the individual letters mirror-shaped in comparison with the modern forms. It is placed in a circle around the shoulder of the vessel. The Laguna Copperplate inscription (also shortened to LCI), found 1989 in Laguna de Bay, in the metroplex of Manila, Philippines, has inscribed on it a date of Saka era 822, corresponding to April 21, 900 C.E. according to Vedic astronomy, containing words from Sanskrit, old Javanese, old Malay and old Tagalog, releasing its bearer, Namwaran, from a debt in gold. The document mentions the places of Tondo, Pila and Pulilan in the area around Manila Bay and Medan, Indonesia. It shows the strong links present between the Tagalog speaking people of this time and the various contemporary civilizations in Asia, most notably the Middle kingdoms of India and the Srivijaya empire of Java. The Laguna Copperplate Inscription, among other discoveries made in recent years in the country, such as the Golden Tara of Butuan and fourteenth century pottery and gold jewelry artifacts found in Cebu, is highly important in revising the ancient history of the Philippine archipelago (which prior to the LCI discovery was considered by western historians to be culturally isolated from the rest of Asia, as no evident pre-Hispanic written records were found at the time). It sheds light on the ancient Philippine history, which was previously largely ignored due to the dominantly Hispanic-derived culture present during the Spanish occupation. This document is considered a National treasure and rests in the National Museum of the Philippines in Manila. 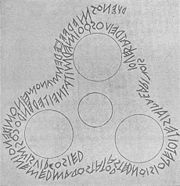 The Phaistos Disc (Phaistos Disk, Phaestos Disc) is a curious archaeological find, likely dating to the middle or late Minoan Bronze Age. Its purpose and meaning, and even its original geographical place of manufacture, remain disputed, making it one of the most famous mysteries of archaeology. This unique object is now on display at the archaeological museum of Herakleion in Crete, Greece. The Duenos inscription, as recorded by Heinrich Dressel. The Duenos Inscription is one of the earliest known Old Latin texts, dating from circa the sixth century B.C.E. It is inscribed on the sides of a kernos, or set of vases joined together with clay, found by Heinrich Dressel in 1880 on the Quirinal Hill in Rome. The inscription is difficult to translate, as some letters are hard to distinguish, particularly since they are in Old Latin. To further complicate the matter, there are no spaces between the letters, so even deciphering which letters belong to which words is a difficult task. The Bitola Inscription of Tsar Ivan Vladislav, restored copy. The Bitola inscription is a medieval stone inscription written in Old Bulgarian. It was found in 1956 during the demolition of an old Ottoman mosque in the town of Bitola, Republic of Macedonia and it is now kept at the Institute and Museum of Bitola. The text commemorates the fortification works on the fortress of Bitola under one Tsar Ivan. It is believed to date from c.1015, in which case the monarch in question would be Tsar Ivan Vladislav of Bulgaria, According to some scholars, the stone is from the thirteenth century, in which case it would be Tsar Ivan Asen of Bulgaria. ↑ The American Heritage® Dictionary of the English Language, epigraph. Retrieved October 5, 2007. ↑ Encyclopædia Britannica Online, epigraphy. Retrieved October 5, 2007. ↑ Corpus Inscriptionum Latinarum, Corpus Inscriptionum Latinarum. Retrieved October 5, 2007. ↑ Thompson, R. Campbell, The Rock of Behistun. Retrieved October 5, 2007. ↑ Lendering, Jona, The Decree of Themistocles. Retrieved October 5, 2007. ↑ Santos, Hector, Sulat sa Tanso. Retrieved October 5, 2007. ↑ Encyclopædia Britannica Online, Latin alphabet. Retrieved October 5, 2007. ↑ Lunt, Horace, “On dating Old Church Slavonic bible manuscripts,” South Slavic and Balkan linguistics, (Rodopi, 1982), p. 230; Mathiesen, R., “The Importance of the Bitola Inscription for Cyrilic Paleography,” The Slavic and East European Journal. 21: 1-2. 1977. All links retrieved August 19, 2017. Epigraphische Datenbank Heidelberg. Epigraphische Datenbank Heidelberg. Oxford University. Centre for the Study of Ancient Documents. This page was last modified on 19 August 2017, at 16:36.